During my post-graduate year studies in 1961 and ’62, I had tried a variety of solutions to develop a more efficient way to deal with locking off and removing the warp ends, when cut, at the two non-selvedge edges of a completed tapestry. I was then the only technically sklled tapestry maker at Edinburgh’s College of Art. In fact, I was certain that I was the only art student or lecturer around Britain with my depth of technical experience in tapestry. There was also little known research anywhere at that time in Coptic or pre-Columbian tapestry techniques. The many mural size tapestries of European origin had simply been cut from the loom and hemmed at these edges. But small tapestries were of increasing interest to me and those edges were clumsy and visually intrusive on small works, so I worked out a new method for at first a 3-selvedge solution, and then later a 4-selvedge solution. No cut warps! I had ‘invented’ an important and unique technique….well, not quite! In fact, three decades later I saw that my ‘invention’– with many variations!–had been commonplace in regions of what is now Peru, woven some three or four centuries earlier! In time I realized that the re-invention of many things, not just in textiles, was no rare occurrence. The real value of my experience was to apply such an approach to the teaching of any skills. To sneakily ‘set up’ students along a journey toward a ‘discovery’ of their own that, as such, was indeed new and unique for them. This certainly encouraged and developed an open and creative thinking process, both in techniques and design development. That was the real gain for me in the 60s! Throughout the years, Archie has written out his thoughts on many subjects related to tapestry weaving and art in general. Many of them have been published in various places. This article on warp sett is published on the American Tapestry Alliance’s website in their section on educational articles. Jeff Sedlick, writing about the jazz trumpeter Miles Davis, commented, “Davis puts as much emphasis on the silence between the notes…” It is surprising how much tapestry has in common with music, and particularly with modern jazz. For example, Miles Davis’ concern with interval in music parallels the importance of a careful consideration of warp spacing, or warp interval, in tapestry cloth. Several issues arise in conjunction with this seemingly straightforward parameter. The spacing between the warp and the size of the weft is, in one sense, a simple technical concern. It involves establishing an appropriately sized empty space between warp threads of a particular diameter. The fineness or coarseness of a tapestry cloth is usually described by giving the number of warp ends per inch. It is arguable, however, that the gap between each warp – the breadth of the warp interval – is as critical to the quality of the tapestry cloth as is the number and thickness of the warps. Put simply, the gap between the warps must accommodate the weft. So the gap itself determines the weft thickness as much as the warp sett does. Yet the nuances of this relationship are often neglected. The space between the warps, along with the fiber type and the direction and tightness of the spin, defines the crispness or softness of the line between adjacent shapes, and is thus, a key aspect in tapestry making. Classic warp to weft and gap to warp relationships for woven tapestry specify that the gap between warps is fractionally wider than the tensioned warp diameter. However, this is a vague definition that does not necessarily lead to absolute numbers. Other factors that add to the complexity of determining a suitable warp interval are: 1) the variety of warp materials employed, for example cotton, wool, linen and silk and; 2) inconsistent sizing standards among the various sources of cotton seine twine. I offer here a useful method for establishing the classic sett of any prospective warp. Take the available warp material and wrap sufficient turns, firm and close, to cover one centimeter on a ruler. 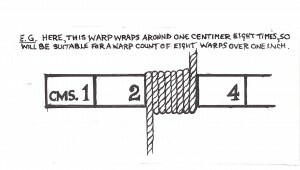 The number of wraps becomes the number of warps in one inch in a classic tapestry cloth (see illustration). Obviously, using this standard with a thicker (or thinner) warp material will produce a finer (or heavier), yet still balanced, tapestry cloth. Although this method of determining warp spacing has a certain universal application, regional and even national variations exist. I use this system myself as a basis for determining a warp sett, although I am prepared to make minor adjustments. For example, if the number of wraps in one centimeter indicates a warp sett of 8epi, I may shift to either 7epi or 9epi, in order to produce a tapestry cloth that has a slightly different density and hand. Varying the warp sett from the classic model results in softer shapes and images when the gap is wider than the classical prescription, and crisper shape abutments when the gap is narrower. A secondary, but not insignificant result of narrowing the warp sett for a given warp size is that the finer warp sett requires a thinner weft, which subsequently results in a slower weaving speed. My argument, and my purpose in discussing this, classic tapestry or otherwise, is to point out that making a conscious choice about the gap between the warps is an important decision often ignored by tapestry weavers. The importance of warp spacing and warp interval has implications for other aspects of tapestry weaving as well. The silence between the notes in music is generally not a subject that receives much attention, but in the visual arts the interval between pictorial elements, the background space itself, is of great concern. It is likely to be given as much thought as the objects being portrayed. The term “negative space” has become something of a cliché for the aspiring painter in recent years but the thoughtful tapestry maker quickly discovers that there is little that is negative about such spaces. They are not something that one gets for free. A very positive act is required to weave the space between pictorial elements and, because of this, the resultant “background” can have a very positive presence. When weaving two leaves, for example, the surrounding space is not a byproduct of creating the leaves. Indeed, the background must frequently be woven first, and it is the shape of the background that determines much of the actual shape of the leaf. 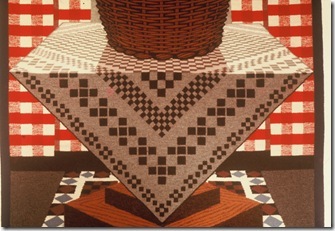 The weaving of the leaves, in fact, is often the easier task – a simple process of filling in. If you think of weaving a row of circles or diamond shapes, the gap between the lower half of each shape must be woven first. Like building a rough stonewall, you cannot position a stone projecting into space and then force the support stone underneath it. Nor can you weave the lower half of a circle or a diamond without building the support first! If you are an experienced weaver, the previous statements may seem obvious. But often the conditions and qualities that we consider obvious are the ones that can offer subtle and significant insights to those who take the time to consider them carefully. Because in tapestry the background shapes add a very positive aspect to the pictorial field and because the growth of the cloth up the warp has a logic that flows from the image and from the process of weaving, the aforementioned parallels with musical performance are further increased. Both are journeys through time marked by rhythm, interval and composition. 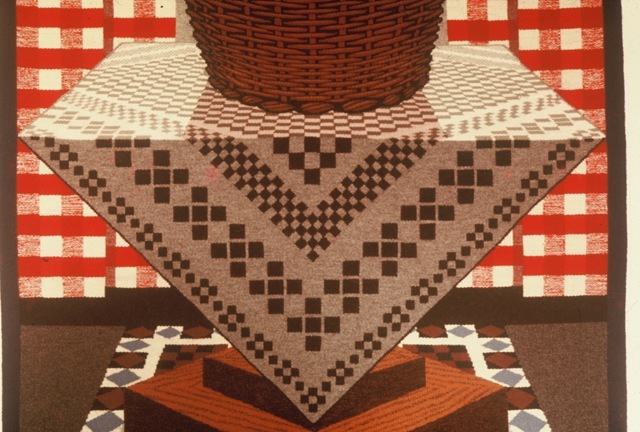 Improvised live jazz and the re-emergence of the designer weaver extend this comparison even further, especially when the tapestry artist explores and exploits this creative journey during the making rather than planning every step beforehand. In contrast, the formal scores of classical music might be compared to late Medieval and Renaissance tapestry with their thoroughly prepared cartoons. One last diversion on interval and spacing. I am not wild about weaving areas of plain weaving. I get bored. Yet, at times I sense the need for a quiet passage. These areas are not just a pause in the pictorial composition. They are also an opportunity to assert “clothness” as a valuable element in the vocabulary of tapestry making. These “empty” areas can be an opportunity to introduce a subtle surface change by using different weft materials or a weft with a different spin. But, of course, this change can in time get boring to weave as well. Well, maybe it’s a moment for some background music. Perhaps Miles Davis? Recently I arranged that seventy-two colleagues and friends return these tapestry woven postcards to me, by mail, from around the world. I had adapted an airline map (JAL) that was centered on Tokyo to cover the entire world with the North Pole at its center. This view of the world is as distorted as any flattened world map must be. It is also symbolic of the inevitable reality that each of us carries on our own world map. 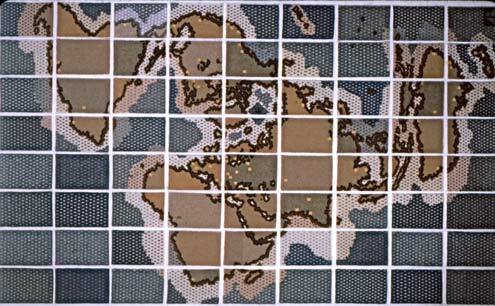 Ours is an individual map laden with conditioned points of view, with biases that grow out of our own limitations. It goes beyond the accident of geography. Our maps encompass our environmental, social, national and personal experience. As a more general comment, I have mailed some 100 tapestry postcards and packages all around the world for more than 30 years. Perhaps surprisingly, not one has failed to reach its intended destination. detail of "Henry VIII with 'Coptic' beard - A Reconstruction of an anonymous 16th century portrait," 2006. 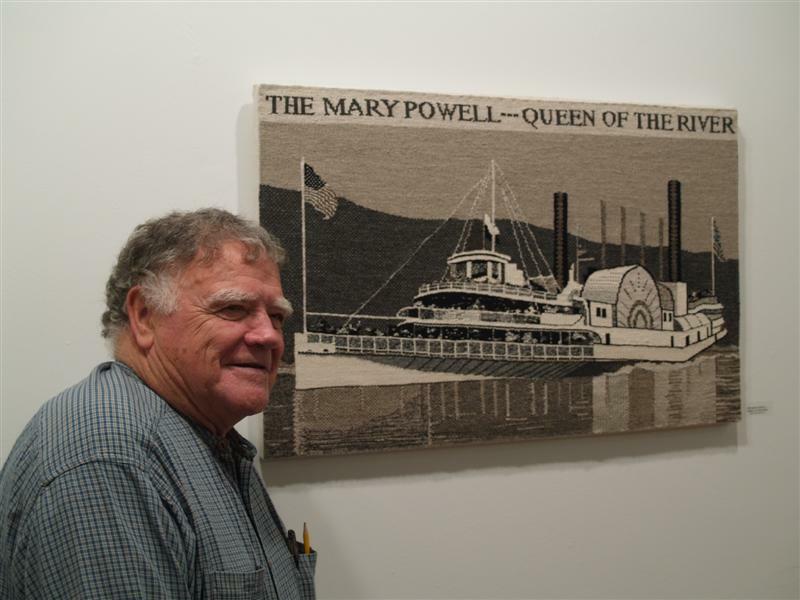 From ATA (American Tapestry Alliance): For the next month the Archie Brennan online exhibition will continue to be available for viewing. It is curated by Anna Byrd Mays and includes a large body of tapestry images and some essays by Archie which give insight into his work. Here is a wonderful exhibition showcasing many of Archie’s works in one location! It is curated by Wednesday Group member AnnaByrd Mays who has done a terrific job giving background information and organizing the images into themes, such as “Windows/Textiles/People,” “Packages and Postcards,” and “Words,” just to name a few. Enjoy! Detail from “At a Window,” 1974.